One of the best things about making a large batch of waffles is that they freeze really well. We made quite a bit with the batch recipe below that some were frozen and later toasted briefly during those mornings where we rush through to get out the door to work/daycare. We also found they are delicious when topped with ice cream for a quick dessert when it's too hot (or too lazy) to bake. 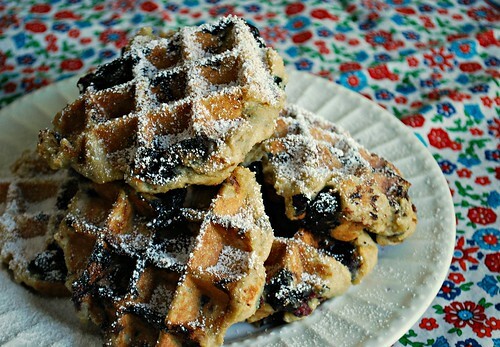 However you decide to enjoy your waffles, you can make them with other fruits instead of blueberries (like raspberries, blackberries, strawberries, pitted cherries, bananas, peaches, etc) or omit the fruit entirely. But for Joel, blueberries are definitely his favorite (... at least that day it was. His 'favorites' tend to change daily lol. I also included the GF flour substitutes also taken from America's Test Kitchen, if you prefer to use a store bought GF flour mix such as King Arthur and Bob's Red Mill brand. In a medium bowl, add the gluten free flour blend, sugar, salt, and baking soda and whisk together. In separate bowl, whisk buttermilk, eggs, and melted butter until combined. Slowly whisk buttermilk mixture into flour mixture thoroughly until batter has thickened and no lumps remain, about 1 minute (batter will be thick). Bake waffles according to manufacturer’s instructions (use about 1/3 cup batter for 7‑inch round iron and generous 3/4 cup for Belgian waffle iron). Repeat with remaining batter. 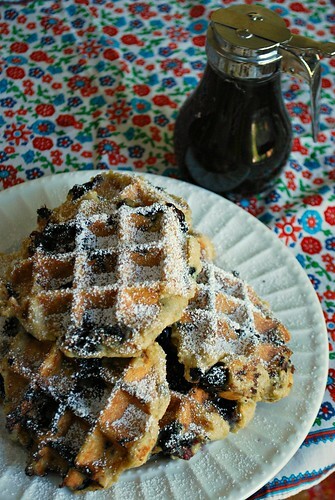 Serve immediately and garnish with powdered sugar; serve with maple syrup. - Note that waffles made with Bob’s Red Mill will be somewhat darker and have a slight bean flavor. Looks great! 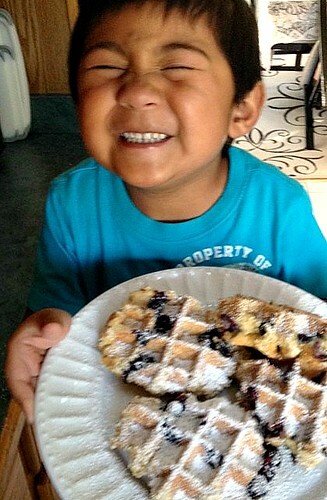 We love waffles in our house. Very nice item that can be enjoyed any time during the day. I will share this because most of what I write about is gluten free these days. 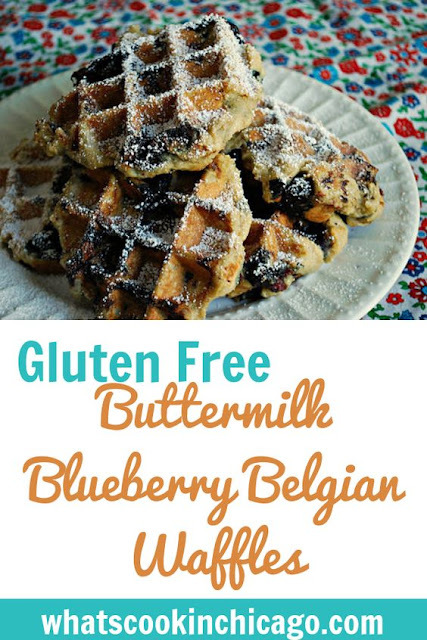 Thank you for sharing your recipe for GF flour. I have a friend that goes in halves with me when buying GL items like rice flour etc. so it cuts the cost way down. Yes, I'm so ready for the weekend! However I'd love to have these any morning! !